Hone your skills for the upcoming paddling season with Paddle Antrim and Michael Gray, founder of Uncommon Adventures. Michael Gray is the Michigan Director for the American Canoe Association and an ACA Level 3 Coastal Kayak Instructor and Level 4 instructor. He also holds certifications in Canoe and SUP instruction. Through his business Uncommon Adventures, Michael has led paddling trips all over the world including Alaska, New Zealand, Greenland, Iceland and Central America. Registration for the kayaking safety classes is extremely limited with a maximum student-to-instructor ratio of 5:1. All participants must be at least 14 years old. Sign up here. June 15, 9 a.m.–12:30 p.m. or 1:30–5 p.m. This class is for new paddlers and those who may have been paddling but are looking to learn basic safety skills and improve stroke technique. June 14, 9 a.m.–5 p.m. This course will cover the skills taught in the half-day fundamentals session but will also cover additional stroke enhancements, risk assessment, rescue types and how to do a successful Eskimo roll. We caught up with Michael over the phone—he’s currently in South Carolina for the Charleston Outdoor Fest—about must-follow rules, essential gear and best places to paddle. You’ve kayaked all over the world. What keeps you coming back to the Great Lakes? 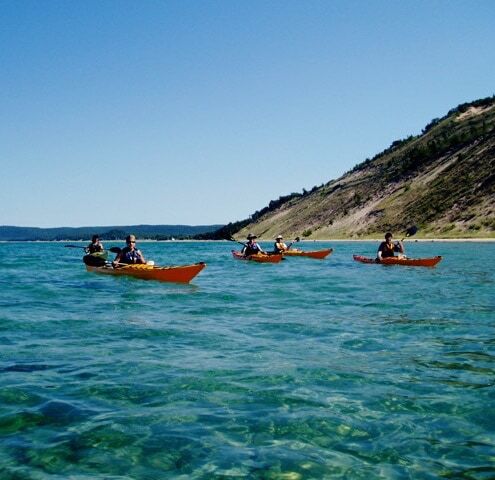 I was raised near Grand Rapids and no matter how far away I go to paddle, I’m still brought back to the Fresh Coast by the variety of coastal experiences that can be found in our inland seas. 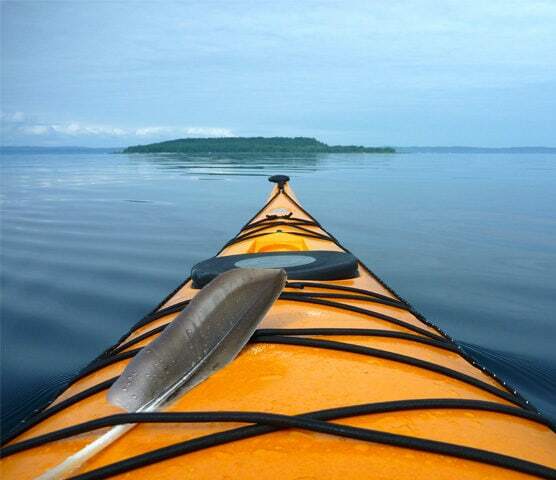 What are some of your favorite lakes or rivers to kayak in Michigan? I’m mostly an open water person, so lakes Michigan, Huron and the one they named right—Superior—are my favorites for longer trips. 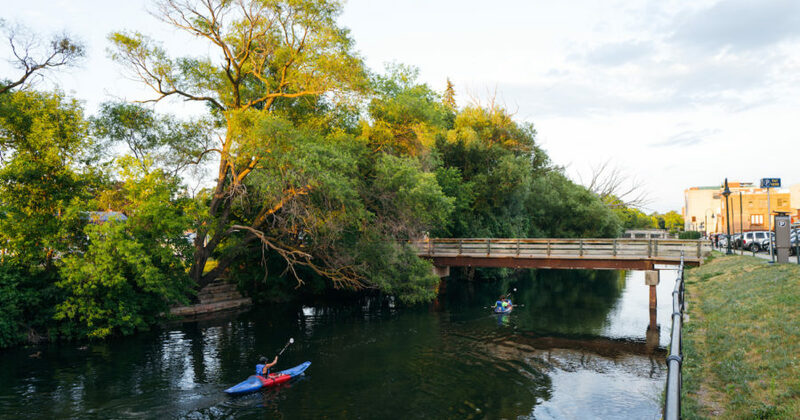 Michigan has so many fantastic rivers that are beginner friendly as long as paddlers are prepared. Since I’m also a fly fisher, I really am drawn to our colder water trout waters like the Manistee, the Little Manistee and my home waters of the Betsie. What essential gear do you take when you go kayaking? Glad you asked. First and foremost, I wear a comfortable life jacket both for safety and warmth. Secondly, proper dressing for the water conditions (never cotton) and dry clothes just in case I need them. Gearing up for a trip also means drinking water, food, a way to call help, spare paddle, first aid kit and repair kit. My boat has all of that even for a two-hour float down the Boardman River. Do you have any other must-follow rules like don’t wear cotton? All clothing for paddling should be able to keep you warm even when its wet—fleece, synthetics, wool, work-out tights—any of it is better than cotton which absorbs water like a sponge and holds it against your body sapping it of heat. What can participants expect during your classes with Paddle Antrim? They’ll learn 90 percent more than 90 percent of the paddling public is aware of in three hours. Besides basics like dressing for paddling, we’ll work on efficient strokes for going forward, turning and stopping. We will also learn how to avoid capsizing and what to do when you capsize as well as how to rescue others. Pretty good life insurance … not many three-hour classes can save your life like this. Michael also happens to be an incredible outdoor chef. Here are a few of his recipes, which were featured in Traverse, Northern Michigan’s Magazine.